Viola Mildred (Thor) Anderson age 95 died on Sunday September 30 at the Cokato Manor. She had been a resident for five years. Born to Oscar and Pauline (Meth) Thor in Wilton, North Dakota she attended Grass Lake School. After graduation from Wilton High School she became part of the United States Cadet Nurse Corps and enrolled in the nursing program at Bismarck Evangelical Hospital. In 1945 she attained her RN license and worked in various hospitals including: Midway (St. Paul), Cokato (until it closed), and Buffalo Memorial Hospital until her retirement in 1988. Viola was a long time member of the North Crow River Lutheran Church. Her faith and love for Jesus were evident to all who knew her. 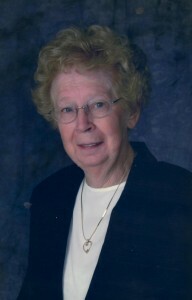 She enjoyed entertaining family and friends, gardening, traveling, and quilting. She was preceded in death by her husband- Wayland Anderson, sisters-Sadie Thor, Erma Sundblad, and Rose Marie Rosenau. Survivors include sister- Helma Rogers, children-Cheryl Anderson (Rochester, MN) Brian (Fern) Anderson (Eau Claire, WI) grandchildren Ben (Hannah), Joel (Abby), Gretchen, Darren, Rachel, Connor, great-grandson Levi Anderson, brother-in-law Ron (Glorian) Anderson and many nieces and nephews. Services will be Thursday, October 4, 2018 at 10:30 AM at North Crow River Lutheran Church. Visitation will be 5-7 at Swanson-Peterson Funeral Home in Cokato on Wednesday, October 3, 2018 and continue 1 hour prior to the services at church on Thursday.